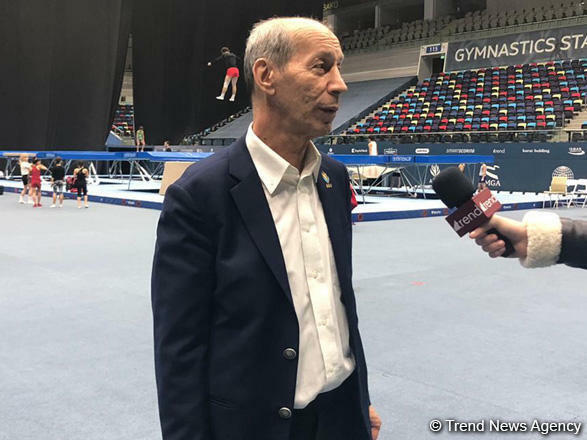 Azerbaijani gymnast Mikhail Malkin has big chances to win gold at the upcoming World Cup in Trampoline Gymnastics and Tumbling, Adil Huseynzade, head coach of the Azerbaijani team in tumbling, told Trend. "We hope that Malkin will be fully ready for the competitions within two weeks," Huseynzade added. “The competition among the participants will be intense and Malkin’s strongest rival is an athlete from Russia,” he added. Huseynzade also stressed that the athletes are delighted with the conditions created in the National Gymnastics Arena. Malkin became the winner of the 26th European Championship in Trampoline, Double Mini-Trampoline and Tumbling in 2018. The World Cup in Trampoline Gymnastics and Tumbling which will be the first competition this year will be held on February 16-17 in Baku. Eight FIG Trampoline World Cups qualifying for the Tokyo Olympic Games will be held in 2019 and 2020 and two of these World Cups will be held in Baku. Baku hosted the European Championship in Trampoline, Double Mini-Trampoline and Tumbling in 2018. The representatives from 26 countries participated in the championship. The World Cups were organized in 2016 and 2017.